A diverse country with something for all kinds of travelers, there is no bad time to visit Morocco, but generally, the best time to visit is during April and May or September to November, the country's shoulder seasons. During these months, the climate is neither too hot nor too cold, and there are fewer tourists to contend with than there would be during the peak summer or winter vacation periods. However, those hoping to trek the Atlas Mountains or surf the waves on the Atlantic coast may find that other times of the year better suit their needs. For many visitors, Morocco's weather is the single largest factor in determining the best time to travel. Morocco follows the same basic seasonal pattern as any other Northern Hemisphere country, with winter lasting from December to February, and summer lasting from June to August. During the peak summer months, the weather can get uncomfortably hot, especially in Marrakesh, Fez, and southwest Morocco (remember that the further south you go, the closer you are to the Sahara Desert). Coastal destinations like Tangier, Rabat, and Essaouira are a more comfortable choice at this time of year because they benefit from the cool ocean breeze. Despite the heat, many people choose to visit Morocco at this time because it coincides with the European summer vacation. Winters are generally mild although temperatures at night can fall dramatically, with record lows of 26.5 degrees Fahrenheit recorded in Marrakesh. A dusting of snow is not unusual in northern Morocco and​, of course, the Atlas Mountains are prone to heavy snowfall in winter. You can even ski at Oukaïmeden, located 80 kilometers south of Marrakesh. Winters in the north of the country and along the coast can be quite wet, while winters in the south are drier but colder, especially at night. Although it's possible to trek the Atlas Mountains year-round, spring (April to May) and fall (September to October) generally offer the best weather. Although summers in the Atlas Mountains are typically mild and sunny, temperatures in the mountain valleys often exceed 86 degrees Fahrenheit, while afternoon thunderstorms are not uncommon. In winter, nighttime temperatures can plunge to 41 degrees Fahrenheit or lower, while snow precautions including crampons and ice-axes are required above 9,800 feet. Weather in the Atlas Mountains can be unpredictable at any time of year and conditions depend heavily on what elevation you're planning to trek to. Weather-wise, the best time to visit Morocco's beaches is during the summer, when average temperatures of around 80 degrees Fahrenheit offer plenty of opportunities for catching rays, as well as an escape from the intense heat of the country's interior. Sea temperatures are also at their warmest during this time of year, with the average water temperature for July recorded at 70 degrees Fahrenheit. However, summer is also peak tourist season, so make sure to book well in advance, especially if you plan on visiting hotspots like Essaouira or Agadir. If you prefer fewer crowds and lower prices, consider a trip in spring or fall instead. Those that are attracted to the Atlantic coast by its reputation as one of Africa's top surf destinations should ignore the advice above and travel to top spots like Taghazout and Agadir during the winter months. At this time of year, the swell is consistently good and surf breaks are operating at their best. With an average December sea temperature of 65 degrees Fahrenheit at Taghazout, a thin wetsuit is usually enough to keep out the cold even in the depths of winter. If you're planning a trip to the Sahara Desert, the most comfortable time to do so is during fall or early spring. In this way, you'll be able to avoid the bone-dry landscapes and scorching temperatures of summer (which average around 115 degrees Fahrenheit), and the freezing nighttime temperatures of winter. At any time of the year, temperatures tend to plummet after dark, so it's best to bring a warm jacket regardless of when you plan to visit. Although spring is generally a good time to visit the desert, it's important to remember that April, in particular, can bring with it the sandstorms of the Sirocco wind. Morocco is home to a whole host of exciting annual festivals, some of which are well worth planning your trip around. Some, like the Kelaa-des-Mgouna Rose Festival and the Erfoud Date Festival, are connected to the harvest and take place in the same month every year (with these particular festivals taking place in April and October respectively). Others, like the Essaouira Gnaoua and World Music Festival and the Marrakesh Popular Arts Festival, are summer extravaganzas that rely on good weather to hold performances and events outside. 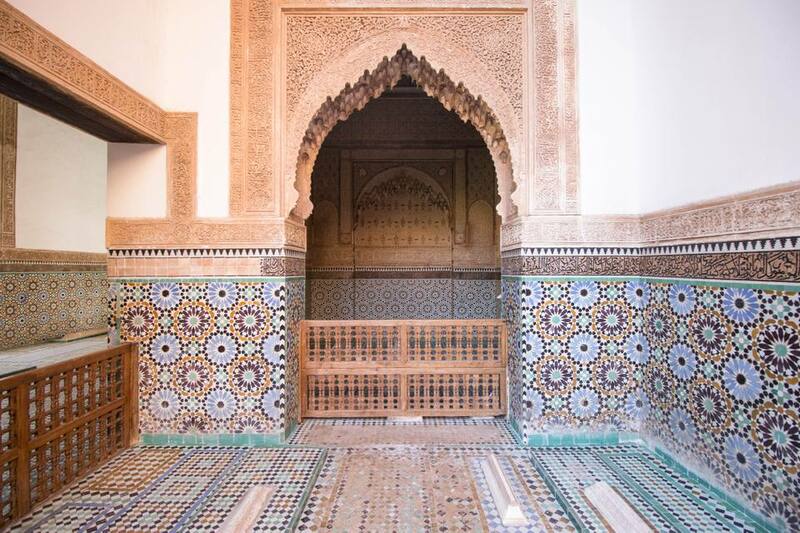 Islamic festivals like Ramadan and Eid al-Adha also take place at specific times of year and offer a fascinating insight into Moroccan culture. Spring weather in Morocco is warm and dry. Snow is gone from all but the mountain's highest peaks, and while ocean temperatures are cooler, it's nothing that a wetsuit won't fix. Crowds are lighter in the spring, too. Fez hosts the Gnaoua Music festivals in May, combining modern music with historical traditions. Moroccan summers can be quite hot, especially the further inland you go. With school holidays, summer is a popular time for families, so hotels and resorts (especially those with pools) will book up fast. Ramadan typically takes place over the summer. Fall is a great time to visit Morocco's cities as well as the coast. With cooler, dry temperatures it's also an ideal time for those interested in great hiking weather. Eid al–Adha is held in September, spanning three days. Muslims commemorate the honor of Abraham throughout the country by sacrificing animals. Visiting Moroccan cities in the winter can be quite pleasant, as temperatures usually aren't too cold and crowds are minimal. There will be snowfall at higher elevations and temperatures drop in the desert at night. The International Film Festival is held annually in Marrakesh. The festival was established in 2001 to promote all forms of cinema.